Globally, thousands of heart patients have been treated with stem cells from bone marrow and other sources. While many of these patients have been helped by these treatments, the results have been inconsistent, and most patients only show a modest improvement in heart function. The reason for these sometimes underwhelming results seems to result from the fact that implanted stem cells either die soon after they are delivered to the heart or washed out. Since the heart is a pump, it is constantly contracting and having fluid (blood) wash through it. Therefore, it is one of the last places in the body we should expect implanted stem cells to stay put. To that end, cardiology researchers a Emory University in Atlanta, Georgia have packaged stem cells into small capsules made of alginate (a molecule from seaweed) to keep them in the heart once they are implanted there. W. Robert Taylor, professor of medicine and director of the cardiology division at Emory University School of Medicine, and his group encapsulated mesenchymal stem cells in alginate and used them to male a “patch” that was applied to the hearts of rats after a heart attack. Taylor’s group compared the recovery of these animals to those rats that had suffered heart attacks, but were treated with non-encapsulated cells, or no cells at all. The rats treated with encapsulated cells not only showed a more robust recovery, but they had larger numbers of stem cells in their hearts and showed better survival. Of this work, Taylor said, “This approach appears to be an effective way to increase cell retention and survival in the context of cardiac cell therapy. It may be a strategy applicable to many cell types for regenerative therapy in cardiovascular medicine. Readers of this blog might remember that I have detailed before the inhospitable environment inside the heart after a heart attack. Oxygen levels are low because blood vessels have died, and roving white blood cells are gobbling up cell debris and releasing toxic molecules while they do it. Also the dying cells have released a toxic cocktail of molecules that make the infarcted area very inhospitable. Injecting stem cells into this region is an invitation for more cells to die. Previous experiments have shown that preconditioning stem cells either by genetically engineering them to withstand high stress levels of by growing them in high-stress conditions prior to implantation can increase their survival in the heart. Encapsulation keeps the mesenchymal stem cells together in the heart and “keeps them happy.” Encapsulation, however, does not completely cut off the cells from their environment. They can still sense the cardiac milieu and release growth factors and cytokines while they are protected from marauding white blood cells and antibodies that might damage, destroy, or displace them. Alginate already has an impressive medical pedigree as a biomaterial. It is completely non-toxic, and chefs use it to make edible molds to encase other types of tasty morsels. Dentists use alginate to take impressions of a patient’s teeth and it is also used a component of wound dressings. One of Taylor’s co-authors, an Emory University colleague named Collin Weber has used alginate to encapsulate insulin-producing islet-cells that are being tested in clinical trials with diabetics. Encasing cells in alginate prevents them from replacing dead cells, but mesenchymal stem cells tend to do the majority of their healing by means of “paracrine” mechanisms; that is to say, mesenchymal stem cells tend to secrete growth factors, cytokines and other healing molecules rather than differentiating into heart cells. Mesenchymal stem cells can be isolated from bone marrow or fat. One month after suffering from a heart attack, those rats that had suffered a heart attack saw their ejection fractions (a measure of how much volume the heart pumps out with every beat) fell from an average of 72% to 34%. However, rats treated with encapsulated mesenchymal stem cells saw an increase in their ejection fractions from 34% to 56%. Those treated with unencapsulated mesenchymal stem cells saw their ejection fractions rise to 39%. One of the main effects of implanted stem cells is the promotion of the growth of new blood vessels. In capsule-treated rats, the damaged area of the heart had a blood vessel density that was several times that of the hearts of control animals. Also, the area of cell death was much lower in the hearts treated with encapsulated MSCs. The encapsulated stem cells seem to stay in the heart for just over ten days, which is the time is takes for the alginate hydrogels to break down. Taylor said that he and his lab would like to test several different materials to determine how long these capsules remain bound to the patch. The goal is to use a patient’ own stem cells as a source for stem cell therapy. Whatever the source of stem cells, a patient’s own stem cells must be grown outside the body for several days in a stem cell laboratory, much like Emory Personalized Immunotherapy Center in order to have enough material for a therapeutic effect. Scientists from Case Western Reserve in Cleveland, Ohio have used hydrogels (jello-like materials) to make three-dimensional structures that direct stem cell behavior. Physical and biochemical signals guide stem cell behavior and directs them to differentiate and make tissues like muscle, blood vessels, or bone. The exact recipes to produce each particular tissue remains unknown, but the Case Western Reserve team has provided a way to discover these recipes. Ultimately, scientists would like to manipulate stem cells in order to repair or replace damaged tissues. They would also like to engineer new tissues and organs. Alsberg and his colleagues have tested their system on mesenchymal stem cells, and in doing so have turned them into bone or cartilage cells. Regulating the presentation of certain signals in three-dimensional space may be a key to engineering complex tissues; such tissues as bone and cartilage. For example, if we want to convert cartilage-making cells into bone-making cells or visa-verse, several different signals are required to induce the stem cells to change into different cell types in order to form the tissues you need. To test their ideas, Alsberg and coworkers two different growth factors directed the stem cells to differentiate into either bone or cartilage. One of these growth factors, transforming growth factor-beta (TGF-beta) promotes cartilage formation while a different growth factor, bone morphogen protein-2 (BMP-2). Alsberg and his crew placed mesenchymal stem cells into an alginate hydrogel with varying concentrations of these growth factors. Alginate comes from seaweed and when you hit it with ultraviolet light, it crosslinks to form a jello-like material called a hydrogel. To create gradients of these growth factors, Alsberg developed a very inventive method in which they loaded a syringes with these growth factors and hooked them to a computer controlled pump that released lots of BMP-2 and a little TGF-1beta and tapered the levels of BMP-2 and then gradually increased the levels of TGF-1beta (see panel A below). Fabrication of microparticle-based gradient alginate hydrogels. (A) Photograph of gradient making system. (B) Flow rates of two syringes to pump a linear gradient for a 5 cm length × 2 mm diameter alginate hydrogel. After linear gradient pumping for 3 min, an additional 50 μL of alginate solution, which is the volume from the Y point to the beginning of quartz tube, was further pumped into a spiral mixer for 1 min. (C) Photomicrographs of microparticles in cross-sections of gradient alginate hydrogel segments. Segments 1-10 represent sequential segments of the gel. 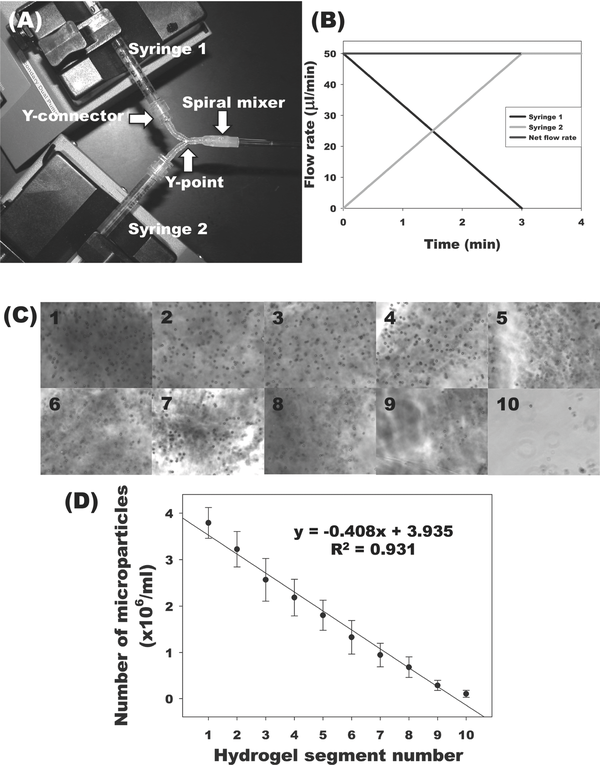 (D) Quantification of microparticles in each segment of gradient alginate hydrogels. The result has an alginate hydrogen with mesenchymal stem cell embedded in it that had a high concentration of BMP-2 at one end and a high concentration of TGF-1beta at the other end. 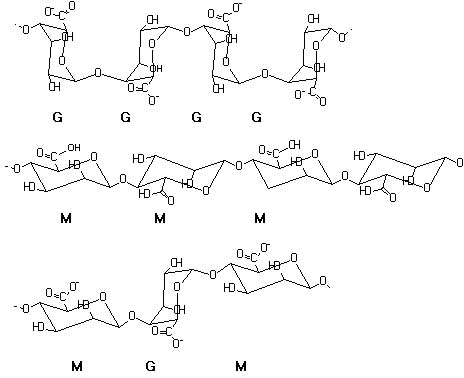 Alsberg also modified the hydrogel by attached RGD peptides to it so that the stem cells would bind the hydrogel. The peptide RGD (arginine-glycine-aspartic acid) binds to the integrin receptors, which happen to be one of the main cell adhesion protein on the surfaces of these cells. This modification increases the exposure of the mesenchymal stem cells to the growth factors. After culturing mesenchymal stem cells in the hydrogel, they discovered that the majority of the cells were in the areas of the hydrogel that had the highest concentration of RDG peptides. In another other experiment Alsberg and others varied the crosslinks in the hydrogel. They used hydrogels with few crosslinks that were more flexible and hydrogels that have quite a few crosslinks and were stiffer. The stem cells clearly preferred the more flexible hydrogels. Alsberg thinks that the more flexible hydrogels might show better diffusion of the growth factors and better waste removal. This technology might also be a platform for testing different recipes that would direct stem cells to become fat, cartilage, bone, or other tissues. Also, since this hydrogel is also biodegradable, stem cells grown in the hydrogel could be implanted into patients. Since the cells would be in the process of forming the desired tissue, their implantation might restore function and promote healing. Clearly Alsberg is on to something.